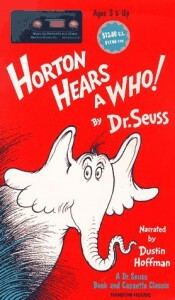 This book is about an elephant, Horton, who hears a voice coming from a tiny speck of dust. He realizes that there are creatures living on the speck. He tries his best to convene those around him that there are creatures living on it. Sadly, the beings around him did not believe him and ultimately attempt to destroy the speck out of pure cruelty. Eventually the creatures living on the speck make enough noise that the creatures of the forest hear them. Thus, they are safe again. This book is a great recreational read for children. It is also a great book to use during Dr. Seuss week at school. This book has a lexile level of 490L, so children in the 1st and 2nd grade could read it independently.